The Benefits of Hibiscus Flowers. Hibiscus (Hibiscus rosa-sinensis L.) is a shrub plant Malvaceae tribe originating from East Asia and widely planted as an ornamental in tropical and subtropical regions. Large Flowers, red and odorless. Hisbiscus flowers of various cultivars and hybrids can be a single flower (petals layer) or double flowers (petals coated) white to yellow, orange to deep red or pink. The hibiscus flowers have a sweet taste and neutral. Chemicals contained in the leaves of hibiscus among taraxeryl acetate. In addition, hibiscus flowers contain cyanidin, hibisetin, diglucosid, bitter substances, and mucus. 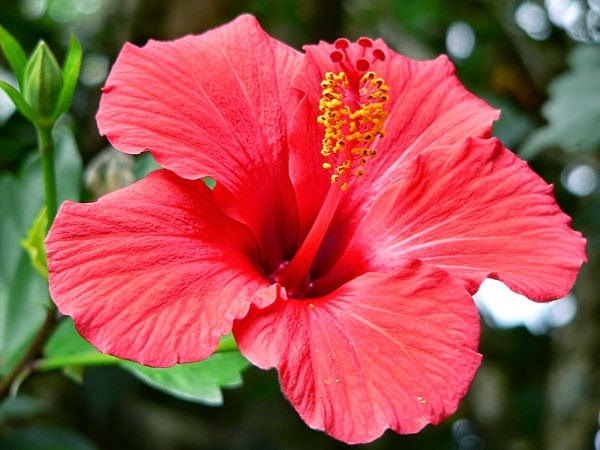 Pharmacological effects owned by hibiscus whom antiviral, anti-inflammatory (anti-inflammatory), antidiuretic, menormalkal menstrual cycle, and shed sputum. Hibiscus flower is also used to treat urinary purulent (gonorrhea), cough and purulent sputum, whooping cough (pertussis), ulcers (furunculus), ulcers in the child's head, ulcers (ulcustripicum), dysentery, irregular menstruation (irregular menstruation), urinary tract infection, vaginal discharge (leucorrhoea), launch period (emenagog), inflammation of the airways (bronchitis), and tuberculosis (TB). In addition, the leaves are used to treat ulcers, fever due to malaria, mumps (parotitis), nosebleeds (epistaxis), inflammation of the skin (dermatitis), catarrh, inflammation of the cornea (conjuctivitis), and inflammation of the intestine (enteritis). Wash 6 flowers of hibiscus and 15 g bitter (Androgaphis paniculata) then boiled in 600 ml of water until the remaining 300 ml. Strain boiled water and add 1 tablespoon of honey. Drink three times in a day. Rinse 2 other hibiscus flowers knead. Brewed with 400 ml of hot water, then cover the dish overnight. Strain the water the next day, add the honey and drink in the morning before eating. Rinse 2 flowers of hibiscus, then milled until smooth. Add 100 ml of warm water and a little salt, then squeeze. Strain and drink the juice twice a day with the same dose. Boil 50 g of hibiscus leaves, 1/2 leaves of papaya (Carica papaya), and 10 g of British salt (sulfas magnesicus) with 1/2 liter of water to boiling. Drink boiled water while still in warm. Rinse and 30 g of leaves or flowers of hibiscus, then boiled with 400 ml of water until the remaining 200 ml. Strain the cooking water and drink three times a day with the same dose. Boil 15 g of root hibiscus, 25 g meniran (Phyllanthus urinary L), and 30 g of bitter (his Androqap panleulata) in 600 ml of water until the remaining 300 ml. Strain the water boiled, then drink twice a day. Boil 15 g of hibiscus, 15 g of chicken's comb (Celosia cristata L.), and 30 g of fresh pomegranate skin or ig skin dry pomegranate (Punica granaturn L.) in 500 ml of water until the remaining 200 ml. Strain the water boiled, then drink twice a day. Rinse 3 bud of hibiscus flowers, others milled until smooth. Add 150 ml of lukewarm water and white rice vinegar to taste. Filter the water, then drink two to three times a day each 100 ml. Boil 30 dried hibiscus flowers with 500 nil of water until the remaining 200 ml. Strain the cooking water and drink twice a day. Boil 30 g of root hibiscus with 400 ml of water until the remaining 200 ml. Strain the water boiled and then drunk. Alternatively, boil 15 g of hibiscus leaves in 400 ml of water until the remaining 200 ml. Strain the water boiled and drunk while still in warm. Boil 25 g of hibiscus and 50 g bitter (Androgaphis paniculata) in 600 ml of water until the remaining 300 ml. Strain the water boiled, then drink twice a day. 30 g brewed hibiscus leaves with 100 ml of boiling water for 15 minutes. Once cool, strain the boiled water and drink three times a day with the same dose. Wash 3 hisbiscus flowers shoes and 30 g purslane (Portukzca oleracea L), then milled until smooth and add 100 ml of hot water. Strain and drink the water steeping three times a day along with 1 tablespoon of honey, each with the same dose. Warning; Pregnant women are forbidden to drink a decoction of this medicinal plant. Each treatment is done on a regular basis. For severe disease, still consult with your doctor. Contact Herbal Specialist before. That the Benefits Flower Shoes. If you have any suggestions or criticisms, please feel free to submit here. If there are other benefits that have not been listed here, please leave a comment below, may be useful for you.